The exhibition has been prepared by the Military History Museum in Prague in the basement. It consists of more than 40 exhibits – weapons and vehicles used by soldiers during past 110 years. „The exhibits are taken from our permanent exhibitions, alternatively we took something from our depositories. Visitors will be able to see again some exhibits after a long time, others are exposed after a long time“, says col. Michal Burian, director of museums of the Military History Institute. 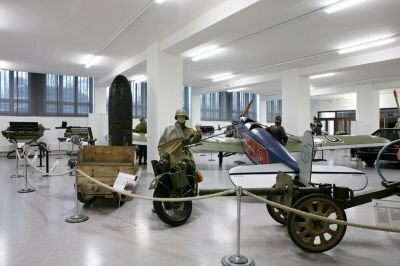 The Military History Institute in Prague belongs together with the National Technical Museum in Brno to three major collecting institutions in the Czech Republic in the field of historical technology. The collection of the Military History Institute has been created since the end of the World War I and today it consists of 31 collection funds of historical cold and fire weapons, tin soldiers, visual arts and cinema. Historical technology is part of aviation, automobile, and heavy military equipment. Their focus is oriented on military production but it also includes a number of historical civil technology. It is due to the historical development of collection funds as well as trying to make the development of domestic and foreign technology related to military production as illustrated as possible. A number of exhibits remain hidden in museum depositories. On the occasion of the reopening of the National Technical Museum a small exhibition from technical collections was set up by the History Military Museum in Prague, most of which are commonly exhibited.